SpotOutlook Password Recovery is the best tool to recover Microsoft Office Outlook passwords. The software recovers password for all versions of Microsoft Office Outlook. 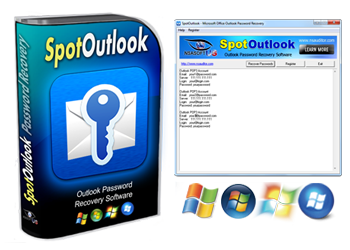 SpotOutlook Password Recovery is the best tool to recover Microsoft Office Outlook passwords. The software recovers password for all versions of Outlook. SpotOutlook Password Recovery is a lightweight and very easy to use application that will help you to decrypt the passwords stored by Microsoft Office Outlook. With SpotOutlook Password Recovery can retrieve passwords from Microsoft Office Outlook. SpotOutlook Password Recovery is the easiest to use toolkit on the market. With SpotAuditor you can rocover Facebook, Twitter, Google Plus+, LinkedIn, MySpace, LiveJournal, Pinterest, Badoo, myLife, Orkut, AOL, Yahoo and more accounts passwords. You can recover Microsoft Outlook Express, Microsoft Office Outlook, Gmail, Hotmail, Yahoo! Mail, AIM Mail, Mail.com and more passwords with SpotAuditor.